We offer Edge Binding Machine Prince Smartto our clients. Machine is light in weight, so it can be used for large size boards where the job is fixed onto a table & machine can be used on it. Include manual end cutter for maximum edge banding thickness 0.3 to 1mm. Include manual edge trimmer for maximum edge banding thickness 0.3 to 0.6mm. Low maintenance m/c,easy available cost effective spares, best service support. Robust feed chain & conveyor system with German gearbox gives straight movement & effective pressure on small / big panels. Heavy duty knife with pneumatic pressure cuts the edge banding materials up to 50mm height & 3mm thickness. Trimmer 2R cutter for PVC/ABS gives perfect rounding on edge of straight panel. In order to prevent glue to adhere on panel, this liquid is sprayed to lower & upper edge surface of the panel. Independently adjustable buffing wheels, for cleaning & polishing of the panel edges. Low maintenance m/c, easy available cost effective spares, best service support. Compact and powerful high frequency two independent motors guarantees best finish on edge, sliding on two prismatic guideways with recirculation ball bearings. Easy accessible user friendly control panel positioned at machine in-feed, for easy & quick operations. Sturdy built heavy-duty machine to suit Indian working condition for precise application of edge banding material. Innovative pre-melting sensor operatedTeflon coatedglue tank, which consumes less glue, compare to other edge banders, which results to increase in profits. High frequency compact motors sliding onheavy prismatic guide waysfor perfect finishing with trouble free performance. 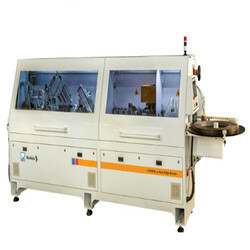 Automatic lowering of the glue temperatureafter a temporary non-use of the machine. Overall meter run (OMR) of edge band tape is display in PLC. Project meter run (PMR) is to calculate total usage of edge band tape in a particular project. Auto lubrication ensuring longer machine life, safe opration, reduced unscheduled downtime and more economical oprating costs. Heavy duty knife with pneumatic pressure cuts the PVC/ABS edge banding materials up to 50mm height & 3mm thickness. Compact and powerful high frequency two independent motors guarantees best finish on edge, sliding on two heavy prismatic guideways with recirculation ball bearings. High level finishing thanks to the sturdy structure that is free of any vibration. Trimmer 2R cutter for PVC/ABS gives perfect rounding on edge of straight, chamfered and regular post formed panel. Scraping unit with an extraction hood complete with a suitable container and filter for long chips. Independently adjustable buffing wheels, for cleaning & polishing of the panel edges. It can be adjustable at a particular angle to maximize it's effect for better finishing of work piec and increase the life of buffing wheels. Easy accessible user friendlySmart TouchPLC control panel positioned at machine in-feed, for easy & quick operations. 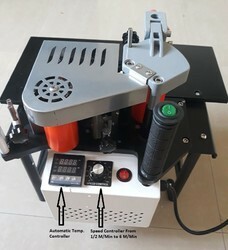 Easy adjustment of trimming & buffing unit. Made of special material which guarantees long lasting sturdiness & stability. Synchronous teeth of belt & pinion gives high traction & vibration free movement with optimal panel holding. Edges in rolls are loaded automatically and cut precisely to size with a cutter. Pneumatically operated End cutting unit has solid cutter to guarantee a clean, precision cut on the front and rear edges of the panel. Compact and powerful high frequency motors guarantees best finish on top and bottom edges. Unit has copiers which are bearing mounted to ensure smooth panel feed. Very easy precision adjustment of trimming cutters by position indicators. Easy accessible user friendly control panel positioned at in-feed, for easy and quick operation. 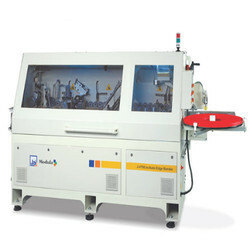 High performance machine with Dualfeeding speed12m/min for PVC/ABS & 6 m/min for wooden strip. Motorized up-down movement of pressure beam for easy thickness setting. Smooths the panel for achieving perfect joint line of the edge. 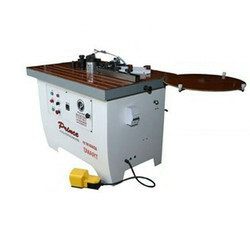 Trimmer flat cutter for wooden strip as well as for PVC/ABS, trims the straight edge of panel. Trimmer 2R cutter for PVC/ABS gives perfect rounding on edge of straight, chamfered and post formed panel. 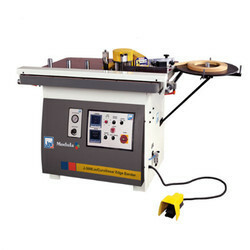 The most efficient entry-level edge-bander, the panel industry can get in this category. Do all your basic edge-banding work on it with Euro standard features like optimal and consistent glue-spreading, heat bonding and pneumatic edge-cutting. 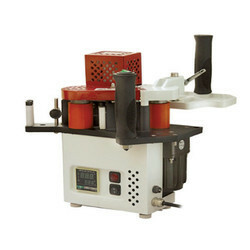 The machine guarantees perfect glueing on board as well as on tape at all times and is versatile and suitable to be used by small and large manufacturers. Efficient bonding system The glue in the glue pot, glue leveler, wiper, the extrusion screw and the heating element all make a bonding system. 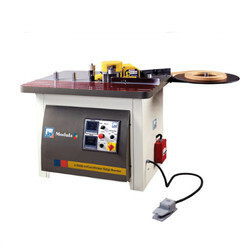 Pneumatic cutter on the work tableThe pneumatic cutting device can be set to actuate the pneumatic cuttur to cut the band. 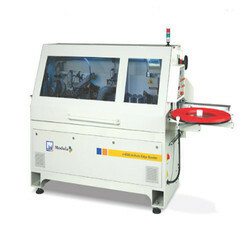 Electronic counter can be used to cut the pre-defined length for curvilinear jobs. The machine has a specially designed hylum surface working table for heat insulation and side roller support at both ends, which helps in easy movement and feeding of workpiece on the table. 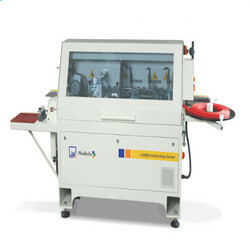 The pneumatic cutting device can be set to actuate the cut of band for a pre-defined length using an electronic counter. The glue pot, glue leveler, wiper, extrusion screw and the heating element all make a bonding system. Hylum surface working table can be tilted from 0 to 45 Degree & a unique "Swivel BAr Roller system" for guiding & supporting the work piece. Easy accessible user friendly PLC control panel positioned at machine front, for easy & quick operations. 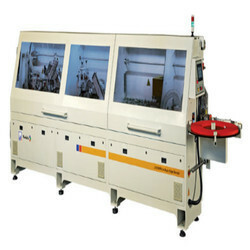 We provide Prince Gold Edge Binding Machine to our clients. Tape thickness up to 3mm. Variable speed 1/2 meter per minute to 6 meter per minute. Glue pot capacity -750 ml.